Argyle Feed and Hardware now carries Texas Wildlife Supply Fire Pits made for the discriminating hunter and landowner. These fire pits are built by Texas Wildlife Supply, a family owned company in Brady, Texas. Dedicated to designing and manufacturing the highest quality custom built hunting blinds, deer feeders, feed bins and feed jets, it was only a matter of time before fire pits became part of their hunting products. 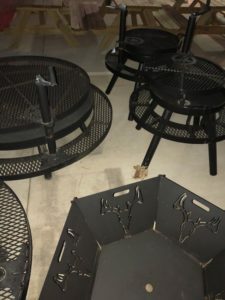 With their love of the outdoors combined with their knowledge of wildlife management, these fire pits are made with durability and functionality in mind along with the top grade materials. Maintaining high standards in manufacturing, engineering, and assembly processes, makes Texas Wildlife Supply number one in the industry. This entry was posted on Wednesday, December 20th, 2017 at 2:40 am	and is filed under News & Updates, Wildlife, Deer. You can follow any responses to this entry through the RSS 2.0 feed. Both comments and pings are currently closed.